I prepared these osteoporosis guidelines for my clients because I believe that health education is key to a healthy life. These osteoporosis guidelines are a part of my Health Guides series. I spend a lot of my time with my clients explaining key concepts related to their bone health and I use this blog (as well as my books) as a reference tool. The challenge for my clients is that there are so many articles on various osteoporosis topics. I decided that I needed to create these osteoporosis guidelines to house these articles. I’m Margaret Martin and today I want to cover the guidelines for osteoporosis and exercise. This little overview is my baby, in the sense that when MelioGuide was started, it was started all around osteoporosis. And all around the need for people with osteoporosis to be empowered, to know what it is that is safe to do, because the last thing you need to do is to not move. So there’s so much fear that’s all involved around osteoporosis, that this guide is really there for you to be empowered to move. To know how to move safely, to know how to do the strength exercises that are safe for you, the right cardiovascular exercises, the most appropriate flexibility exercises, so you can just enjoy the stretch without feeling that your putting your spine at risk. The Osteoporosis Guide is going to provide you with essential information, such as, what type of equipment? I have blogs devoted to weighted vests, vibration platforms, and hip protectors. Also, so many people ask me my opinion on pharmaceuticals. Well you get my opinion and the opinion of a pharmacist that are well-recognized in Canada. Nutritionists that have contributed to my blog, with information on proper nutrition, on supplements. There’s also great resources for individuals who are out of this mainstream of osteoporosis. Their osteoporosis isn’t just a result of having hit menopause, but rather because they’ve had an eating disorder, or they have cancer, or they had polio when they were a child. I address osteoporosis within special populations. 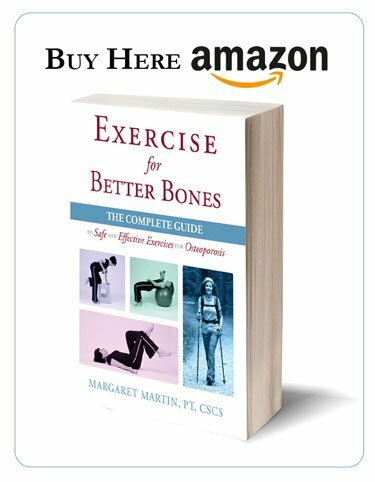 If you have not yet purchased Exercise For Better Bones, I strongly encourage you to supplement this guide with the Exercise for Better Bones Program. Because that was my very first big step in training thousands of professionals, so that they could also help their clients one-on-one. But that’s your ultimate guide that will have all your exercise schedules, so that you will know day by day, step by step, what it is that you should do. And so that is definitely the first step you should do, and use all of these blogs to supplement it. Because as years went on and as I updated the book, I still had so much information to share and that information is here within these blogs. But it’s really complementing the book the entire way. The Exercise For Better Bones is there for you. There are four levels for you to work from, from beginner to elite. And so there’s something for everyone, and I encourage you to feel empowered. That’s the essence of the Osteoporosis Guidelines is to allow you to have the information that you need, so that you can move safe, enjoy life, and respect where your bone density is, but understand the difference between your bone density and your bone quality. Know that every step you make, moving in the right direction, is the step that’s going to help you build stronger bones. So thanks for tuning in. I’m Margaret from MelioGuide. 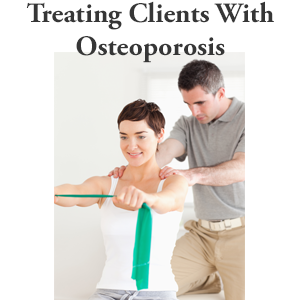 Every day I treat clients who have been diagnosed with osteoporosis, osteopenia, or low bone density. I tell them that osteoporosis is less a disease that requires medication and more a condition that they need to learn how to live with. The onset of osteoporosis requires lifestyle modifications that reduce the risk of fracture and increase your chance of living a full, active, and independent life. Many of them have been prescribed a pharmaceutical treatment for the condition. However, they realize that they need to do more than take medications and look to me to help them with any lifestyle modifications that improve the health of their bones and reduce the risk of fracture. Most of them have an active healthy lifestyle and they want to maintain that existence as long as possible. Bone health is a lifetime effort — not something restricted to people older than 65. It should start early. But some of us miss that window and need to do things today to maintain their independence and keep an active lifestyle. Instead of becoming preoccupied with their bone density readings, I encourage my clients to focus on reducing their risk of fracture through lifestyle modifications, exercise, and nutrition. These osteoporosis guidelines provide a means to navigate through the various osteoporosis health topics. I have a number of educational resources available for clients and health professionals specifically developed for people with osteoporosis. 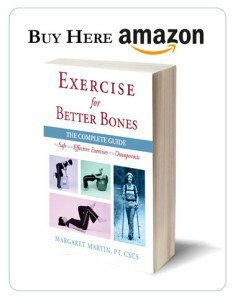 I have a book dedicated to osteoporosis exercise — Exercise for Better Bones. The book is available in print and Kindle format on Amazon. I strongly encourage anyone who want to improve their bone health through exercise to purchase this book. It is a great resource. I have developed four exercise levels and the one you choose depends on your activity level and fracture risk. I provide the tools in the book to help you choose the osteoporosis exercise program best for you. A twelve week exercise program is ready for you that includes strength training, cardiovascular, flexibility, balance, and posture improvement. Another great resource I make available to my clients and visitors to this website is a free, five day email course called Exercise for Osteoporosis. After you provide your email address, you will receive five consecutive online educational videos on your bone health — one lesson each day. You can look at the videos at anytime. I cover important topics related to osteoporosis exercise including stop the stoop (how to avoid the hunched posture associated with osteoporosis), key components of an osteoporosis exercise program, key principles of bone building and exercises you should avoid. If you are a health professional, I encourage you to take my free online course, Working with Clients with Osteoporosis. This five day email course includes a daily video lecture on how to safely and effectively treat clients with osteoporosis, osteopenia or low bone density. During the video lectures, I cover important topics related to osteoporosis including bone density and bone quality, exercise and osteoporosis, nutrition, pharmaceutical intervention, and the implications for your professional practice. I developed a workout video series to help you build stronger bones and a stronger body. This workout video includes three 35-minute video sessions that you can do at home with minimal equipment. Each of the video sessions challenges different parts of your body and will improve your balance, strength, flexibility and confidence. Safe and proper form and posture is encouraged throughout the whole exercise series. 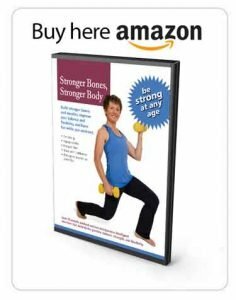 Stronger Bones, Stronger Body is a great standalone workout exercise program and a super complement to the Exercise for Better Bones Program. 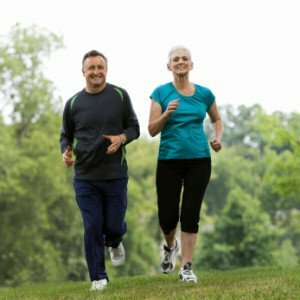 These exercise osteoporosis guidelines are broken into several major areas. You will find blog posts I have written on each to the topics that provide further detail in each of the main topic areas. I recommend new visitors to my site to read the articles I have posted on my page entitled Most Important Osteoporosis Articles. These are a great start to your educational journey. Over the years I have produced a large number of articles on osteoporosis exercise. That should not come as a surprise since I spend a lot of time with clients with osteoporosis and design exercise programs that help them with their bone health. I am also the author of two books on exercise and osteoporosis: Exercise for Better Bones and Yoga for Better Bones. An osteoporosis exercise program should include a combination of flexibility, postural, strength, weight-bearing and balance exercises. Different people have different needs so the exact combination can vary dramatically. When I first meet a new client, I find that many are focussed on bone density and how to increase it. This is not a surprise since many people understand osteoporosis to be a thinning of bone or a reduction in bone density. They ask: how can I increase bone density? This should be a good thing, right? Instead, I get them to consider bone quality and what they can do about that. I felt it was important to call this topic out in these osteoporosis guidelines. In this section you will find several articles that discuss this topic in some detail. In this section of the osteoporosis guidelines, we will cover the things you ingest into your body to improve your health. Good nutrition plays a key role in the health of your bones and the topic deserves its due attention in these osteoporosis guidelines. In this section we will cover the role of calcium, Vitamin D, and other nutritional essentials. These osteoporosis guidelines would not be complete without touching on the role of pharmaceuticals as a treatment option for osteoporosis. For many people, they first learn that they have osteoporosis after they visit their doctor and receive the results of a DEXA bone mineral density test. Their physician prescribes a pharmaceutical and for a number of people this starts them on a search. They are concerned about the effects of a pharmaceutical intervention and want to find alternative treatment approaches. Many wisely learn that they need to make lifestyle modifications and make exercise part of their daily routine. Here are several articles I have posted on pharmaceuticals. Hormones play a critical role in the health of your bones and this is why I have included a section on hormone replacement therapy in these osteoporosis guidelines. In this series, I document my personal exploration with bioidentical hormone replacement therapy. I also did a review of a book I read on hormone replacement therapy. I found this book to be a very useful resource and recommend it to my clients and readers. Some clients need specific equipment to help them build bone, reduce fracture risk, and improve balance. In these osteoporosis guidelines I felt I should have a section dedicated to osteoporosis equipment. Here it is. I encourage those of my clients that need the additional weight-bearing to invest in a weighted vest for osteoporosis exercise. Over the years, I have tried many weighted vests and many clients have shown me their vests. Some are better than others and I have a list of the ones I recommend below. I have several clients who use hip protectors to shield themselves in case of a fall. Hip protectors are frequently used by frail clients but they are also very popular with very active clients who ski and hike and want that extra bit of protection in case of a loss of balance. Vibration platforms have gained popularity as a bone building technique. Here are several posts I have written on the topic. Does Whole Body Vibration Therapy Prevent Osteoporosis? I discuss other types of equipment on my blog to help with balance, bone building, posture and exercise. Osteoporosis is not an isolated condition. Often people have other medical conditions and considerations. In this section of osteoporosis guidelines, we explore several special populations. I asked Mary-Ann Dalzell, recently retired clinical director at the Segal Cancer Centre in Montreal, to discuss cancer and bone health. I customize and prescribe Osteoporosis Exercises to my clients based upon a detailed and thorough assessment of their individual needs. Over the years, I have captured many of these exercises on video. This format works well because I can get into some of the subtle but important details of each of the exercises. 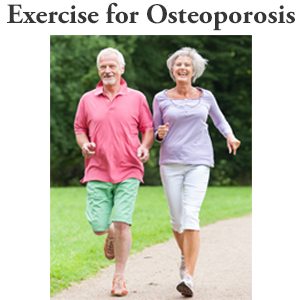 I have created a separate page for the osteoporosis exercise plan. I see many clients who have experienced a compression fracture (also known as a vertebral fracture). Sadly, I find many are uninformed when it comes to managing their vertebral fractures. I hope that this section answers some questions you might have.